Magnificently designed Star slanted with a 2" ball accenting this elegant acrylic award with a purple color accented base. Acrylic thickness is 3/4" thick, laser engraved to a frosted white text. 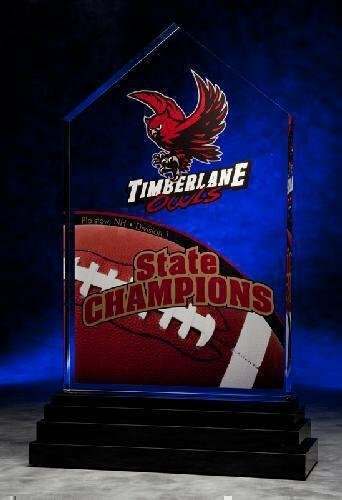 Full color imprinting available as an optional imprinting method for this acrylic award. A moonstone plaque accents this sandstone multi-level surface of this field of stars. Made in the USA. 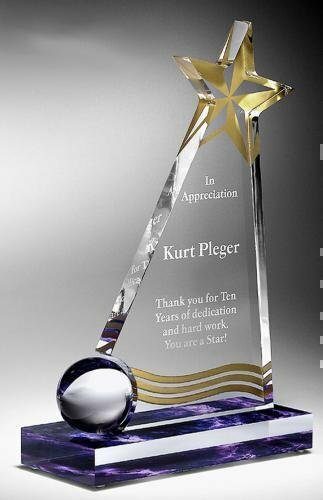 This beautifully designed acrylic award features a custom routed star shape on top making it a great acrylic award for any commemorative event. Available in three sizes and your choice of blue, red, green, gold or purple reflective bottoms. Dramatic acrylic star tower is faceted to create this unique top that shoots out from our stonecast satin ebony finish base. Genuine walnut perpetual plaque with a step edge available in black laser engraved to gold color header plate and perpetual plates. These perpetual plaques are available in nine configurations to meet your needs. The Step Flame acrylic award is beautifully crafted from clear acrylic. It features a bull-nosed step on one side to create the look that is too hot to pass up! Available in your choice of blue, red, green, gold or purple reflective bottom. Available in two sizes.